People born in Aries Sun Sign (Mesha Rashi) may experience obstructions and delays in professional matters. During most of the year 2017, transit Jupiter and transit Saturn will remain in sixth and eighth houses of their natal chart respectively. Jupiter’s transit from sixth house may generate conflicts and disputes with authorities and seniors; while, transit Saturn may generate volatility and insecurity in career. Finance may also remain weak and volatile; and, therefore exercise caution during major financial dealings and also avoid making major investments. Health and relationships may also remain weak and challenging. For people born in Taurus Sun Sign (Vrishabha Rashi), the year 2017 is indicating moderate support for finance. Old issues related to wealth or finance may get resolved; however, complete satisfaction may not be there. Besides, the last quarter of this year 2017 may also generate volatility and insecurity in financial matters. Career may remain average only; and, relationships are also indicating mixed results. Health of parents or relationship with parent may also remain weak and vulnerable. For best planetary support, try to avoid being adamant and try to be a little bit more flexible in your approach. For people born in Gemini Sun Sign (Mithuna Rashi), the year 2017 may remain auspicious and supportive for career. Those looking for promotion or similar benefits may get lucky; and, supportive changes/developments may also take place. Finance may also remain reasonably supportive with income and gains through various means. Gains of property, vehicle, or other valuable assets are also possible. Health and Mood may remain volatile though; and, you may fall prey to anxiety or restlessness on frequent intervals. For best planetary support avoid argument or conflicts; and, take good care of your health. Relationships and family matters may also remain supportive; and, those looking for marriage or love may also expect planetary support. For people born in Cancer Sun Sign (Karka Rashi), the year 2017 may remain weak and disturbed for health; and, and, those facing chronic or typical health issues should be very cautious. Marriage and relationships may remain volatile and tensed. Finance may remain good; and, those looking for purchasing home or property may expect success. Career may remain average with changes and temporary tensions. Those looking for marriage and/or relationships should exercise patience and caution in their approach. Those aspiring for foreign travel or relocation may expect good planetary support. For best planetary support, take very good care of your health; avoid being quick or hasty in your approach; and, give respect to your elders and seniors. For Leo Sun Sign (Simha Rashi) people, the year 2017 is indicating volatility and changes on various fronts. Health and mood may remain disturbed and tensed on frequent intervals; and, there may be confusions or conflicts within family as well as professional relationships. Change of job, relocation or sudden journeys are also possible. Financial matters may, however, remain supportive; old or pending issues related with finance or income may get resolved; and, there may also be some good financial gains during the year. The intensity of inauspicious planetary transit may remain strong during first half of 2017; while, betterment or relief can be expected during second half of the year. For those born in Virgo Sun Sign (Kanya Rashi), the year 2017 may bring happiness and success; there may be auspicious events or celebrations in the family; those looking for marriage or progeny may get lucky; and, gain of wealth is also possible. Those looking for better job, change of job, relocation or foreign travel may also expect favourable results of their endeavours. However, the health of self and/or parents may remain weak and disturbed; and, therefore, try to exercise caution in this regard. During 2017, people born in Libra Sun Sign (Tula Rashi) may remain vulnerable towards financial losses and expenses. There may be frequent conflicts or disputes; and, you may find it difficult to manage and/or maintain your social and professional relationships. Your enemies or professional rivals may conspire against you; health and physical safety may remain a cause of concern; and, there may be sudden or unpleasant changes in job or residence. Try to be economical in your approach and avoid major financial dealings/investments as much as possible. Newly married should also exercise caution and patience during communication. The intensity of these negative traits may remain high during first half of 2017; while, some relief or betterment can be expected during second half of the year. 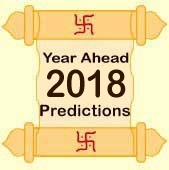 The year 2017 is indicating mixed results for those born in Scorpio Sun Sign (Vrishchika Rashi). There may be pressure and work load in profession; and, you may find it difficult to meet your professional commitment. Finance may remain volatile but positive; and, there may be some good financial gains (specifically during first half of the year). Health and relationships may remain disturbed during first half of the year; while, some relief and betterment can be expected during second half. Those looking for marital alliance or love relationships may experience some delay or emotional setbacks. For best planetary support, avoid being over confident and do not take risky decisions. Dhanu Rashi (Sagittarius Sun Sign) people may expect betterment, success and positive results in profession. Old or pending matters may get resolved; there may be promotion, rise in salary or some other betterment in job; your enemies may get exposed; and, you may also expect victory in legal matters. Health may remain volatile; while, the mood/temperament may remain aggressive or dominant. Marriage and relationships may also pose some difficulties; and, you may find it difficult to devote sufficient time and space in personal matters. Matters related to finance, income and wealth may, however, remain supportive and strong; and, those looking for purchasing property or home may get lucky. For best planetary support, avoid being lethargic or careless in your approach; and, try to keep your priorities straight and clear. Those born in Makar Rashi (Capricorn Sun Sign) may remain vulnerable towards volatility, insecurity and failures during the year 2017. You may remain vulnerable towards taking wrong decisions, hasty initiatives and speculative moves. The professional matters may remain highly volatile; there may be sudden or unpleasant changes; and, job loss is also possible. You may also experience lack of support or comfort within family matters; may have to work or live away from family or parents; and, may experience anxiety or depression or fatigue on frequent occasions. Financial constraints are possible and expenses may also remain high during the year. People born in Kumbha Rashi (Aquarius Sun Sign) may expect moderate support in finance and income; and, some easy or unexpected financial gains are possible during the year 2017 (specifically for those passing through Mahadasa of well placed Saturn or Jupiter). Professional matters may, however, remain average only; and, you may lack satisfaction or comfort within professional and social dealings/relationships. Those looking for marriage may also experience some delay during first half of 2017; while, the second half is indicating betterment and positivity for marriage and relationships. Health may remain average; while, the mood may remain aggressive or dominant. Those born in Meena Rashi (Pisces Sun Sign) may experience mixed results during the year 2017. There may be improvement and positive results pertaining to career and education during first half of the year; while, the second half may generate delay, obstructions or failures. Possibilities of job loss or unpleasant changes in profession are also possible during second half of the year 2017. Those looking for marital alliance should be very careful; and, exercise good amount of caution within love relationships. Financial matters may remain volatile; expenses may remain high; and, possibilities of debt or loan are also present. Therefore, exercise caution in your expenditure and avoid taking loan as much as possible.